For anyone who might be curious, here’s how I built the snake poem I posted yesterday from the upcoming book, NOW YOU SEE THEM, NOW YOU DON’T. My purpose came first. 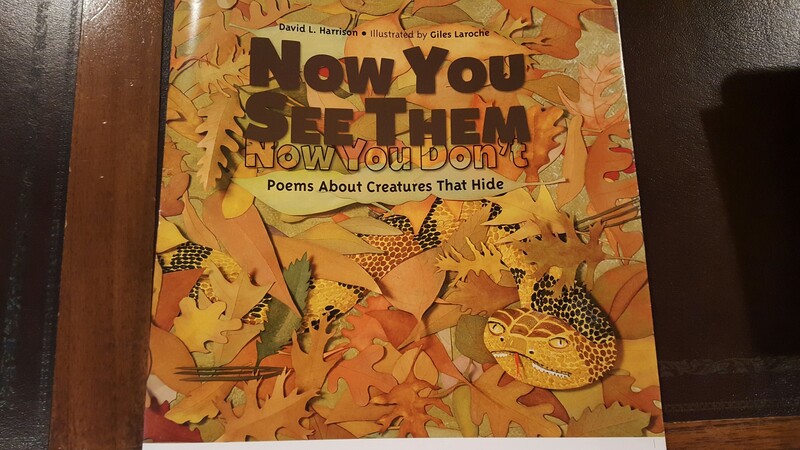 The book was to be about animals that use natural camouflage when hiding or hunting. I selected the copperhead for a list of potential subjects because its natural coloration helps it blend into its background, leading to its success as a predator. Therefore the first draft of the poem was straightforward and focused on making the point that it can be hard to detect the snake when it doesn’t want to be seen. This led to an almost sinister, teasing voice with “Find me if you can” expressing the snake’s sly and deadly intention. What followed were four ballad stanzas rhyming abcb with short iambic lines of alternating 3/2/3/2 beats and each stanza introduced with the same taunting phrase, “Find me if you can.” Although the format was somewhat arbitrary I liked the concise, no-nonsense approach that was established when I chose to begin with that first line. It set the pace and the tone for everything that came after. In the first three stanzas I concentrated on describing ways in which “Mr. Copperhead” was an expert at disappearing in plain sight: leaves, stones, ledge. As I wrote I thought about how to end the poem with a surprise or at least an abrupt truth that fit the situation. How could I conclude this internal monologue the snake was enjoying at the expense of the unknowing mouse? The ending fell into place when I answered the question inherent in “Find me if you can.” If the mouse doesn’t find the snake, then what? Then only one will be there tomorrow! I wrote the final stanza and ended without the reader’s anticipated iambic foot. Instead, for emphasis, I went out with a spondee: a foot with two accented syllables rather than one. It gave it a sense of doom and finality that I wanted. Here’s the poem at that point. I’ll be here tomorrow . . . It was time to consider how I might change the physical appearance of the poem to lend imagery to the power the words. I decided to rearrange the lines to mimic the slender body of the hidden snake. Here again this is how I saw and felt the poem. Someone else might go in a different direction or leave the poem as it was. The words didn’t change. Only their arrangement did. But in my judgment the short bursts of energy added suspense to the unfolding drama by making the reader follow the clues down more lines. What else? But of course! Make that snake sss and sssss and sssssss! This is an old trick and trite, but in this case I saw a particular benefit from using it. This final addition requires the reader to slow down in order to get all those sibilants pronounced without slipping on them. The result is a poem that sounds more like the deliberate musings of a patient hunter, enjoying the wait, watching its victim approach itssssss desssstiny. The poem progressed through specific stages, each adding to the whole by giving it reason, shape, and sound that emphasize the character of the subject and control how the work is to be read to maximize its impact. I won’t try to explain myself on all the poems in the book but I hope you liked this little tour.